On August 1st, 1917, the clouds began to gather with the darkest time in America’s history looming ahead as the first draft of the 18th Amendment to prohibit the sales of booze passed the United States senate. Backed by the teetotaling, and known buzz-kills, Evangelical Protestants, the Prohibition movement had been gaining momentum for decades. “Dry” crusaders such as the Anti-Saloon League and the Women’s Christian Temperance Union, faced off against “Wet” proponents such as Catholics, German Lutherans, and ostensibly the entire Irish population of the US at the time. It took just shy of two years to get the 18th Amendment ratified, but the holier-than thou, fun-hating asshats had their victory and promptly celebrated with widespread self-flagellation and some quiet study of the Good Book. Sure rates of liver cirrhosis fell by 50% during Prohibition, but we were able to get those rates back up to normal with the passage of the 21st Amendment and the Repeal in 1933. 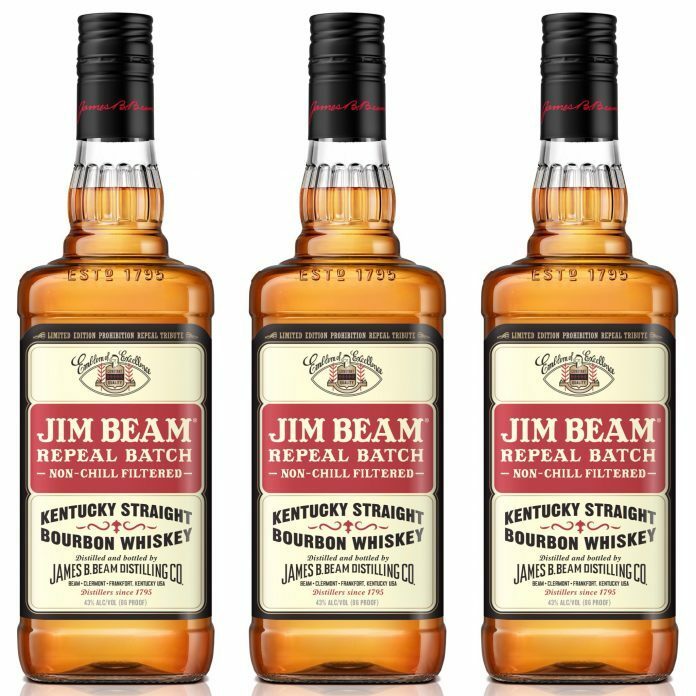 Jim Beam is celebrating the 85th Anniversary of the end of Prohibition with the Repeal Batch, a lower proof, non-chill filtered bourbon designed to reflect the approximate taste profile that Beam would have been producing in the late 1930s, post repeal. In case you’re wondering, “chill filtering” is a process where the distiller chills the whiskey pre-bottling to force ice crystals to form around impurities that form in the barrel aging process. These impurities from the barrels actually add flavor and texture to the whiskey, but can cause the whiskey to turn cloudy if it is stored improperly (too hot or too cold, for instance). It’s mainly a cosmetic issue, but one that will have an effect on whether the consumer will buy that bottle. A higher ABV content in whiskey will help prevent that cloudiness, and that’s where relatively low 86 proof Repeal Batch differs from the rest. This whiskey should be a good introduction for those who have yet to step up to something like Maker’s Mark (90 proof) or Blanton’s (93 proof). Not quite as high octane, but with a great deal of the flavor you’d want from the more expensive whiskey offerings. Total Wine is offering a bottle of Repeal Batch for around $15, so it might be worth it to see what this whiskey is all about. That being said, you’re probably going to get what you paid for. If you’ve had some Jim Beam Repeal Batch, let us know what you think! Wylie Withers is the Commissioner of the Booze League and Co-Host of the BoozeCast. He spent many years as 1/3 of the comedy improv duo The Merry Misfits of Doom before pursing a Masters in Boozing (with a Marketing focus). His posterior was featured on the final episode of Beverly Hills, 90210, earning him his SAG card. He'd like to give a shoutout to his liver and left kidney for always being there for him. Follow him on Twitter @wyliewithers or reach him via email wylie@boozeleague.com. Jun 29 Rogue Farms Honey Kolsch is back!